Hayes got his start in industry rising from an intern at Phillip Morris to a senior analytical scientist at Wyeth Research. “I’ve always had a passion for teaching, but first I wanted to see how the science worked in industry.” Over a decade, Hayes conducted research on tobacco, household goods, appliances and pharmaceuticals. An advisor for Student African American Brotherhood at the Chesapeake Campus, Hayes encourages young men to set goals and work toward them. “I always remind them not to despise small beginnings,” he says, “because what starts small can grow into something big.” Hayes also shares his time advising the Health Professions Club. “I really enjoy being part of the community college system because you can roll up your sleeves and make a difference for students,” Hayes adds. Hayes believes in “chalk-board” teaching and getting students involved in classroom discussions. 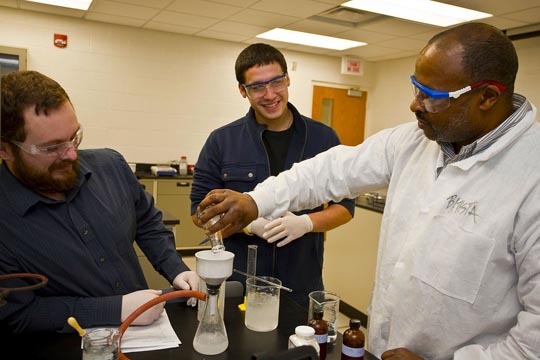 His active style has led many students to pursue chemistry-related careers. Hayes holds a bachelor’s in biology, and a master’s and Ph.D. in analytical chemistry from Virginia Tech.